Cancun, Mexico, is an enticing vacation option with its alluring clear, blue waters and year-round warm weather. Many people are drawn in by the prospect of lying on the beach and soaking up sun with a frozen drink in hand. To best explore the surrounding area, finding the right hotel is vital. First, look beyond the all-inclusive options to the more affordable a-la-carte hotels, where you won’t pay for amenities and services that you won’t be able to use. Next, choose your location based on the activities you’re interested in. Cancun is located on the Yucatan Peninsula, which borders the Caribbean Sea. For this reason, there are a plethora of water sports in and around Cancun. If you bring your own snorkeling gear, you can walk out into the clear water at almost any public beach and see an array of colorful fish and sea life. Punta Nizuc is the closest offshore reef to the hotel zone and is home to some of the artificial reef statues that have been submerged by theCancun Underwater Museum (MUSA), an eco-project that literally brings life to the areas around the natural reef. You can leave the crowds of Cancun behind for a day by taking a quick ferry to Isla Mujeres. 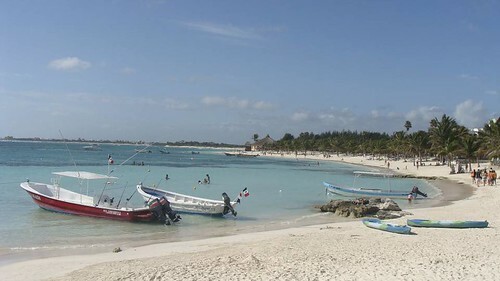 It’s a sleepy island where life moves a little slower and there’s not much to do, but Isla Mujeres is known for its sea turtles, and you can visit the turtle farm for a tour and a look at the amazing creatures in their natural habitat. If you snorkel or swim while on the island, you’re sure to see and swim with the turtles. 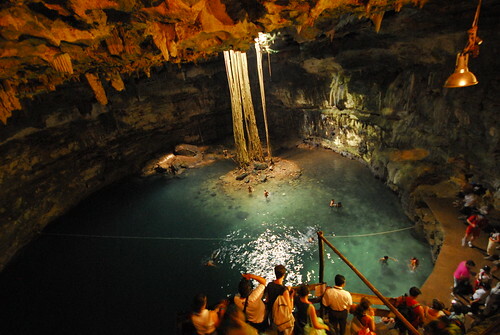 Spending a day at the cenotes is one of the best activities near Cancun. Book a local guide who can show you to the best hidden cenotes the peninsula has to offer. Some of the more popular and easy-to-find cenotes are Gran Cenote and Dos Ojos near Tulum, and Cenote Yokdzonot and Ik Kil near Chichén Itzá. The hotel zone, which is where you’ll find most of the large, high-rise resorts, is not the ideal location if you want to see the non-touristy side of Cancun. Instead, head to El Centro, where you can try authentic Mexican food from street food vendors or cantinas instead of eating at the resort buffet. Alternatively, participate in a cooking class like the one from Can Cook in Cancun, and learn the basics of traditional Yucatan cooking. With all of these great activities in Cancun, you have no excuse not to plan your visit now. Get outside the resorts and discover what Cancun is really all about. Like this post? Save it to your Pinterest board and share it with your friends! This entry was posted in Attractions and tagged Cancun, Mexico. Hey, what about visiting Chichen Itza? It is one of the “New Seven Wonders of the World,” you know. Chichen Itza is fantastic, and definitely worth a visit. It’s a bit far from Cancun though, so it would require a day trip. Adore this! I was in Cancun a while back, but stuck to the centre – oh my god the FOOD!!!! Did you find the giant market with booth upon booth of different foods? Oh lord, it was magical. Definitely so much more to Cancun than resort land! Oh I would love to visit Cancun.Those waters look dreamy and I love Mexican Food! Cancun has a reputation for all-inclusives and Spring Break craziness but the beaches there are ah-mazing! Great tips and recommendations for things to do, I particularly love the cenotes! Agree Katja, that’s why it’s important to get outside of the partying and all-inclusives to see what it’s really like there. I visited the Yucatan with my family when I was twelve and would love to go again to try more of the adventure activities. Snorkeling, swimming with turtles and exploring the cenotes all seem like activities that are right up my alley! Erika, I’m sure you’d love it if you’re into adventure activities! Wow this is one I have to see! 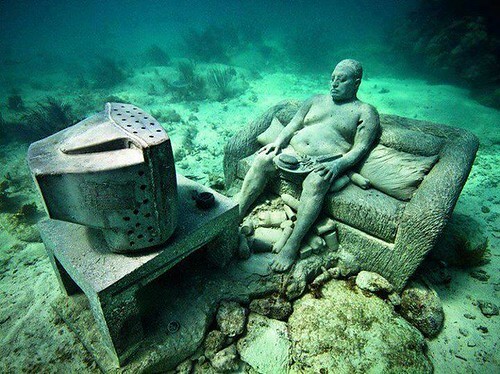 The underwater museum must have been quite a sight! Like a whole other world underwater. Yes, it’s amazing. And it’s really cool what they’re doing to help the reef there. I would be all about eating my way through Cancun. I can only imagine how fresh and flavorful all those meals are. I stayed in downtown Cancun and loved it. All inclusives are great, but there’s so much more to see in Cancun! Absolutely! So many great things to do in Cancun. I haven’t been to Cancun yet but have heard great things, especially when you get away from the resorts. I think digging into some real Mexican food would be my top reason for a visit. 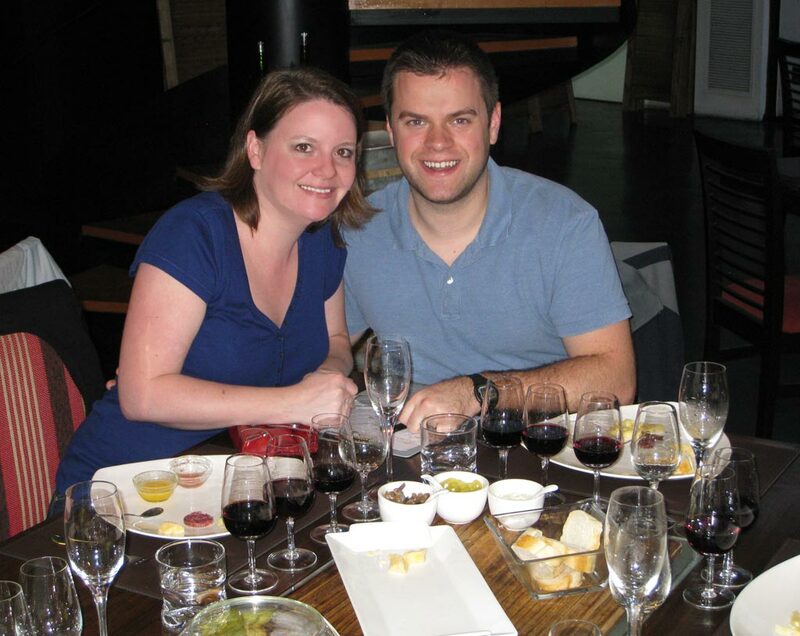 Made it to Cabo earlier this year and had some of the best food I’ve had when we wandered off the beaten path.